Ashley and I hit several estate sales on Friday since she was off and I didn't have to be at school at any certain time! We found so many cute things. Enjoy our mosiac of our findings! Robert E Lee iron, crystal cream pitcher, doily, cake plate, another cake plate and brass candlesticks for the dining room! Am I the only one who can't see a mosaic? Hi Terri, I don't see anything. Boooohooooo. I can't see it, either. Hope to see the mosaic soon!! A very blessed Memorial Day to you! Beautiful post!! I can't see the mosaic either. No, Vee, I forgot to load it! It's here now! And it's a lovely one, too. I'm going back to look more closely right now. 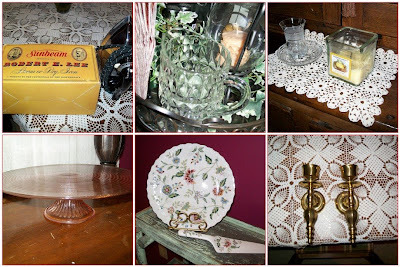 All wonderful finds...love the cake plate and server, but my favorite of all is the pink depression glass cake stand. So lovely! You'll be able to serve summer teas all season long with all of your treasures. Isn't it wonderful when you find treasures like that?! So fun! I love the thrill of the hunt! Hope you enjoy your time before summer school begins.